Moab is a beautiful town in the Canyon Country of Utah. 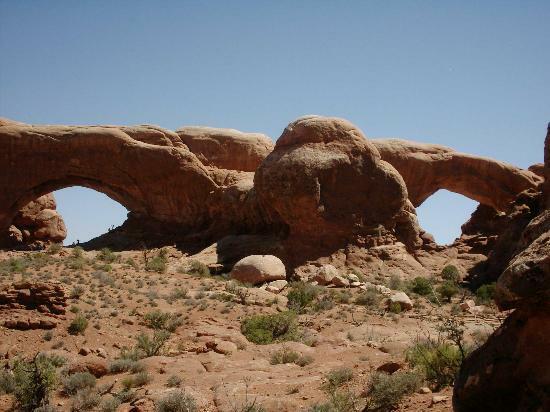 It is also the gateway to the nearest Arches National Park, including different attractions in the Canyon Country. Moab is regarded as a unique western-community that is located in the south east of Utah on the river Colorado. The Arches National Park is just six miles away and the Canyonlands National Park around 32 miles from this place. This city is enclosed by lands that are used for recreation like hiking, mountain biking, rafting, high-lining, skydiving, BASE jumping, cross country skiing and disc golf. As the area is rich in various recreational opportunities, Moab is fast becoming an international tourist services and activity hub. Tourists can view beautiful scenery while driving around the country. Tourists can enter the city by land or by air as the transportation is well connected with the rest of the world. There are hotels of various sizes and tariffs to meet the requirements of the tourists. The hotels of Moab take pride in providing quality services to their guests at reasonable prices. They ensure that their guests are provided with all the comfort and value worth their money. The rooms at the hotels have all the modern amenities that are important to make the guests comfortable. They also have excellent help desks to assist the guests with their travel plans. The various attractions in the region include the Slickrock Bike trail, which is considered to be one of the most popular mountain-biking trails in the world, the Mill-Canyon Dinosaur track, the Moab Museum which has a rich collection of Moab history, palaeontology, geology, mining and anthropology. Tourists who love adventure and sports can enjoy rafting. As the town of Moab is located along the river Colorado, it offers plenty of opportunities for the enthusiasts to be sporty enough. One popular option is the day trip to the Fishers Towers, which is also called ‘Moab Daily’ and is regarded a haven for the tourists with families and children. Every can enjoy the fun and entertainment that this place provides them. Moab is also the home of semi-annual ‘jeep safari’. Sports enthusiasts can enjoy the difficult obstacles and wild rides it provides them with. There are also conducted tours of the Canyonlands National park and Arches park, including floating and rafting adventures in the San Juan, Green, Colorado and Dolores rivers. Another favourite sport among the Bravehearts is skydiving. This place provides the tourists with a perfect skydiving adventure filled with thrills and frills. There are trained personnel’s who make sure that the guests are comfortable and safe while practicing skydiving. Moab can be termed as a place that would pump in energy and action into the individual and is a sure shot hit among those people who love adventure and sports. This is the place for those who dare to do something different and live life according to their thoughts and actions. This is the reason why, this beautiful country remains crowded all the year round by tourists from all over the world.